There are endless adventures you can take with your family and your dog. If you’re going don’t leave your”Man’s Best Friend” in your home. Our pets are already major companions in our lives, so it is all the more fun to make memories away from home with them. Camping is one of the oldest pastimes that people like to do during the summer months. If taking the dog isn’t an option you may look to a dog sitter. I know that leaving the pooch behind can be a difficult situation. There is nothing better than finding a good reliable person to take care of dog. But if not you may take he or she with you and think about a few options I have listed to make your experience a fun and safe outing for you and your dog. 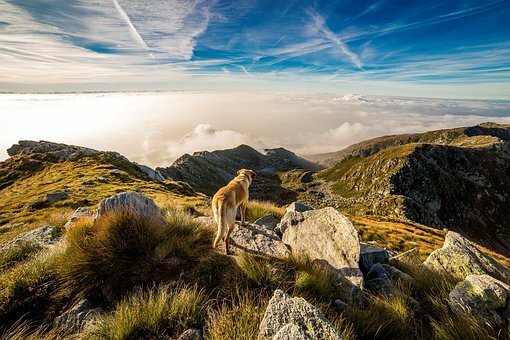 Dogs love to travel – outdoor vacations are their favorite! Dog travel accessories will ensure your pooch is comfortable and secure during your next road trip. From hikes to boat outings, the ideal travel gear will help your pet be ready for it all. Anytime you travel with your dog you should have a car seat. There are many different types of all sizes so be sure and get one that will keep your pet safe. 1 accessory could be a travel dog bowl. Maybe an anti-spill bowl would be beneficial for all concerned. It’s a bowl which doesn’t allow food or water to spill out. There are a variety of bowls available, I’m sure you can find one that’s right for your pet. Always having water for your dog is must. When camping you will want to keep your dog away from other campers. Not everyone are dog lovers. There are hands free straps which convert into a leash. This will also keep your pet safe will being away from your home. You may want to consider a portable dog pen, so your dog can enjoy the outdoors just as much as you do. Keeping your dog safe is a priority especially when outdoor adventuring. Another way to make sure your dog is safe would be to consider a dog life jacket. Even if your dog loves the water there possibly an incident that would require your dog to need a like jacket. There are several different styles and sizes to select from. There are raincoats and warmer coats available too, all designed to keep your pet comfortable and safe. You might want to consider picking up a GPS dog tracking device to get in the off chance that your pooch goes missing. These devices are a excellent way to keep track of your pet when traveling away from home.They let you locate your pet on demand, monitor their activity and record adventures on a smartphone. This device will be convenient in case your dog get lost. Be sure and check the weather before you leave, not only will this help you be prepared for conditions like rain or snow that could slow your travel, you will have a better idea about what to pack for your dog. Keep them comfortable in states they are not used to. Having fun and making memories with your dogs are a excellent way to enjoy the outdoors. Take pictures, share them on social media, whatever will help you remember these trips.